ALEXANDRIA, Va. (CN) – A federal judge said Monday he will push back the start of former Trump campaign chairman Paul Manafort’s trial on multiple fraud charges six days, and that he will grant immunity to five witnesses scheduled to testify for the prosecution. 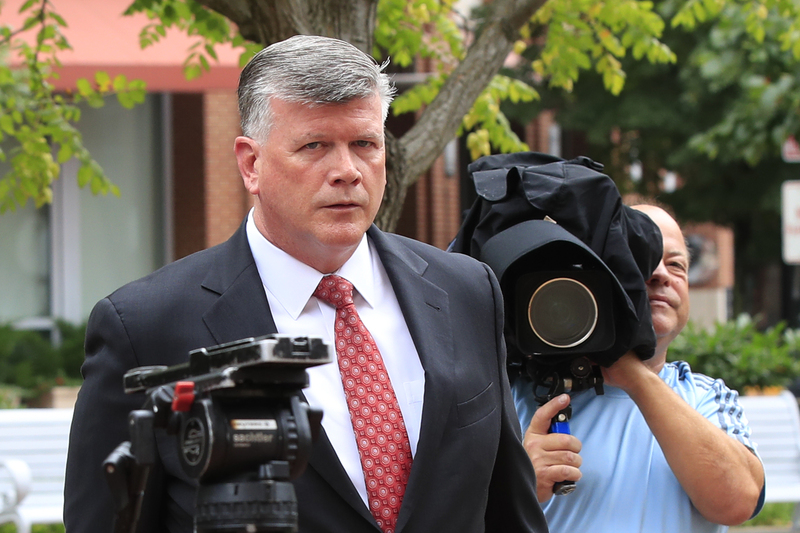 The five witnesses granted immunity Monday are James Brennan, Donna Duggan, Conor O”Brien, Cindy Laporta and Dennis Raico, all of whom are connected to financial institutions. Manafort’s trial in Virginia was scheduled to begin on Wednesday. It now will not start until July 31, in order to give the Manafort defense team more time to prepare. In the meantime, Ellis will move forward with jury selection Tuesday despite the delay. He also said he will unseal a variety of government documents in evidence and has requested special counsel provide a definitive list of 30 witnesses who will testify later at Manafort’s trial. Manafort, who appeared in court Monday for the first time since he was put in detention, donned a dark green jumpsuit and rumpled white t-shirt. Once seated, defense attorney Kevin Downing wasted little time asking Judge Ellis to continue the trial beyond its scheduled start date of July 25. Thousands of pages of evidence, namely documents the government obtained on Rick Gates’ iPad, iPhone and laptops, have not yet been reviewed by the defense, Downing said, and a continuance is needed. Attorney Kevin Downing said 120,000 new pages of documents have been turned over to defense since July 6. More than 70,000 come from Gates’ devices, but prosecutor Uzo Asonye said many of the documents were merely photos, internet search results and data from applications used on a cell phone belonging to Gates. “I’m not sure what looking at those pictures will do for their case,” Asonye said. Plus, there are roughly 49,000 pages – amounting to some 20,000 documents – from Manafort’s accounting firm, NKSFB, their team has not yet seen, he claims. Ellis seemed surprised the information from NKSFB was never provided to Downing by Manafort’s previous representation at the firm Wilmer Cutler Pickering. “We thought we would get it in discovery, your honor. We thought it would be a lot cheaper,” Downing said. “No. It just depends how you calculate dollars and cents,” Ellis said. Before deciding whether Downing needs more time, Ellis called a brief recess Monday to consider the matter. Regarding Special Counsel Robert Mueller’s motion to reject Manafort’s request to exclude evidence related to his lobbying work for Ukrainian president Victor Yanukovych, the judge said Monday he would make his decisions on a case-by- case basis. He also asked to see any evidence related to Ukraine first before making a ruling on its usability. Ellis also said Trump could be mentioned by name during trial, but only in connection with a specific bank loan Manafort received currently in question. On a related note, Special Counsel Robert Mueller asked Ellis in a motion filed Sunday to reject former Trump campaign chairman Paul Manafort’s request to exclude evidence related to his lobbying work for Ukrainian president Victor Yanukovych. Last week, Downing asked Ellis to preclude evidence such as emails and text messages from Manafort’s trial. He argued the documents compiled on Manafort and Yanukovych were irrelevant to the multiple bank and tax fraud charges his client currently faces. Downing took issue with Mueller’s proposed use of a memorandum offering guidance on Yanukovych’s political campaign strategy, an email forward to Manafort featuring the Ukrainian president’s election night speech, shared itineraries for Manafort’s travel to the Ukraine and a PowerPoint presentation on Ukraine Opposition Party campaign strategy. Downing has also asked that photographs of Yanukovych be kept out of evidence. On Sunday, Mueller rejected claims that the evidence would be “irrelevant” or confusing for jurors. “The superseding indictment alleges in pertinent part that Manafort’s subscribed tax returns were false in that they failed to report in full the income he earned through political consulting and lobbying work performed for Ukraine, as well as the offshore accounts through which he was paid,” wrote Andrew Weissmann, prosecutor and special assistant to Special Counsel Mueller. The exhibits around Yanukovych “serve to prove an essential predicate of [the offenses] – namely that Manafort earned millions of dollars in income for services rendered for Ukraine,” the filing states. The evidence will corroborate expected witness testimony at trial as well, Weissman said. Yanukovych’s fall from power in 2014 is also “highly relevant” to the “dramatic decrease” in Manafort’s income, an integral reason why Manafort is being charged with bank fraud, Special Counsel argues. Prosecutors merely wish to present information about this part of Manafort’s work as a “setting of the case” for jurors. Contentions that the evidence would risk “unfair prejudice” by jurors was also rejected by Special Counsel. “That Manafort did work for Ukraine and was paid through accounts in Cyprus are relevant facts in a prosecution charging failure to report income and foreign accounts. Further, there is nothing unduly prejudicial about doing legal political consulting work for Ukraine; indeed, Manafort has touted that he served to bring that regime closer to western ideals,” Weissman said. Offering a peek behind evidence collected in the run up to trial, prosecutors told Ellis Monday afternoon that Stephen Calk, CEO of the Federal Savings Bank, was aware that at one time, Manafort submitted a phony loan application. Prosecutors claim Calk approved it anyway, hoping he could snag a job within the Trump administration. Additionally, prosecutors dismissed concerns that the trial could shift away from the subject matter at hand – bank and tax fraud – and into questions around the broader investigation by special counsel, i.e. Russian collusion in the 2016 election. On Tuesday, Judge Ellis will hear arguments from attorneys about the content of a jury questionnaire the court plans to submit to jurors July 31. Ellis said questions must remain tightly focused. He also emphasized that questioning related to the “theater” surrounding the White House won’t be tolerated. “I’m not in the theater business,” Ellis said.